Exciting track and field action took place this past Friday at the MHSAA Region Meet, which was hosted by Grand Haven. On the girls side, Rockford's Ericka Vanderlende continued her excellent season by collecting a pair of event wins. The junior recorded a Michigan No. 1 / US No. 6 time of 4:45.85 to secure the 1600m victory and she finished first in the 3200m due to her 10:29.10 effort. Hudsonville's Melanie Helder placed first in the 800m race with her time of 2:14.09 and Grand Haven's McKenna Keefe claimed the pole vault event win due to her Michigan tie for No. 25 vault of 10-6. 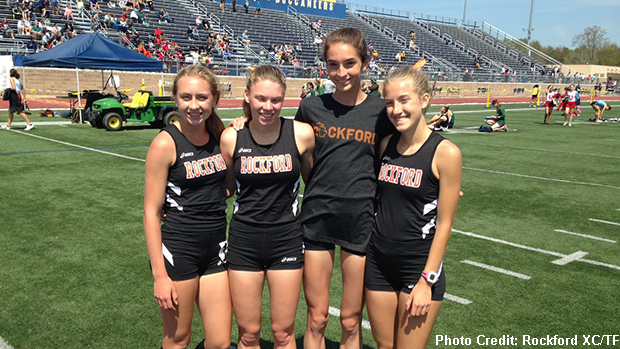 Rockford took an emphatic win in the 4x800m relay competition. Their 9:23.32 clocking represents a Michigan No. 4 time for the 2018 outdoor season and it was twenty-one seconds ahead of the runner-up team from Grand Rapids Forest Hills Northern. Rockford's squad consisted of: Camryn Gabriel, Caleigh Dunn, Karlie Gardner and Ericka Vanderlende. In boys action, Cole Johnson of Rockford won the 800m and 1600m races with his times of 1:55.59 and 4:20.02, respectively. Johnson is ranked second in the state in the 800 and the 1600 from previous outings this season (1:53.87 and 4:11.73). The throwing events saw Gavin McIntyre and Anthony Bradford pick up first place results. Rockford's McIntyre recorded a throw of 157-1 in the dicus competition and Bradford of Muskegon set a new pr in the shot put event with his throw of 52-10.75. This performance stands for a Michigan No. 15 for the 2018 outdoor campaign. Ryan Talbot had a strong showing in the pole vault event, as the junior from Grand Rapids Forest Hills Central captured the win due to his Michigan tie for No. 9 vault of 14-6. In team relay competition, Muskegon Reeths-Puffer earned the 4x100m victory due to their 42.66 effort. Team members include: Jalen Ware, Parker Aerts, Drey Riley and Rylee Bonjernoor. This is the fastest time posted by a Michigan team this season. The aforementioned Ware also performed admirably in the 100m individual finals, as the senior took first place via his 10.85 (Michigan No. 7) clocking.